Born in South Devon in 1961, Sophie Walbeoffe studied Fine Art at Wimbledon School of Art, London, under the tutelage of Maggie Hambling and Prunella Clough to mention a few. She continued her studies with Cecil Collins at the Central School of Art, London. Sophie Walbeoffe has always been immersed in the art world. Her French great grandparents were both painters living in Antibes during the 1920s and her great uncle established the Courtauld Institute of Art. Travelling extensively over the course of her career, in 1987 Sophie Walbeoffe arrived in Dubai to paint the desert inhabitants and their landscape, after which, she returned overland painting in Jordan, Petra and Egypt. It was in Dubai where she learnt of the British explorer Wilfred Thesiger and subsequently in 1988 joined Operation Raleigh as the official artist on the expedition in Kenya. 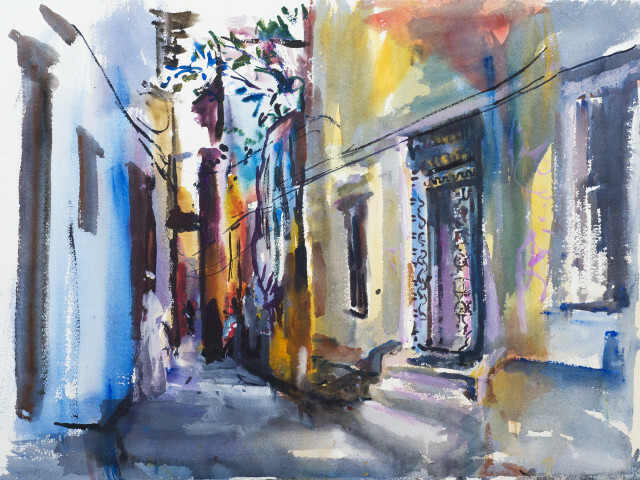 In 2013 and 2014 Sophie lived in Jerusalem where she painted many of the architectural wonders of the city, its surroundings and its people. Sophie Walbeoffe currently lives in Nairobi, Kenya but regularly returns to paint in Europe, enjoying the challenge of contrasting landscapes. Her work reflects a wonderful awareness of life, nature and discovery as if the world is her oyster. Her painting, in whatever medium she chooses, is often achieved by working straight from her easel in any location that inspires her imagination. Her enthusiasm is such that she sometimes paints with both hands simultaneously. Her subjects range from sun drenched landscapes to bustling city scenes and evocative seascapes.